Reed-Solomon codes are used to perform Forward Error Correction (FEC). FEC introduces controlled redundancy in the data before it is transmitted to allow error correction at the receiver. The redundant data (check symbols) are transmitted with the original data to the receiver. A Reed-Solomon Decoder is used in the receiver to correct any transmission errors. 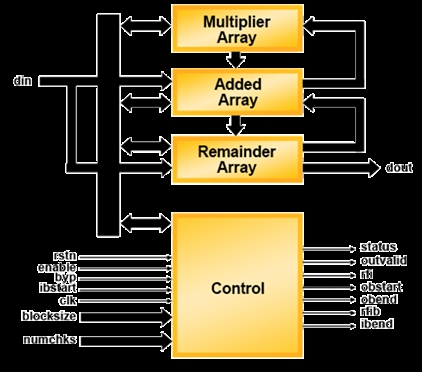 This type of error correction is widely used in data communications applications such as Digital Video Broadcast (DVB) and Optical Carriers (i.e. OC-192). Reed-Solomon codes are written in the format RS(n,k) where k is the number of information symbols and n is the total number of symbols in a codeword or block. Each symbol in the codeword is wsymb bits wide. The first k symbols in the Reed-Solomon Encoder output are information symbols and the last n-k symbols are check symbols. This type of encoder, where the information symbols are unchanged and are followed by check symbols in the output, is called a systematic encoder. The figure below illustrates the operation of a systematic encoder.